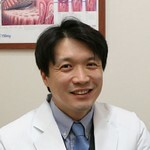 Jae Hee Cho, MD, PhD from the Division of Gastroenterology, Department of Internal Medicine, Gachon University, Gil Medical Center, Incheon, Republic of Korea presents this video case. A patient who underwent biliary plastic stent placement for pancreatic head cancer with central bile duct (CBD) invasion was admitted for hematochezia. Abdominal enhanced computed tomography (CT) showed a high-density lesion in the second portion of the duodenum, we performed endoscopic retrograde cholangiopancreatography (ERCP). ERCP showed that the stent was filled with blood clots. After removal of the previously placed CBD stent, we confirmed spurting hemobilia. To overcome this potentially fatal hemobilia, we placed a covered self-expandable metal stent (SEMS) into the CBD. The stent was unfurled, which stopped the bleeding. No further gastrointestinal bleeding or anemia occurred. The patient was readmitted 2 months later with cholangitis. 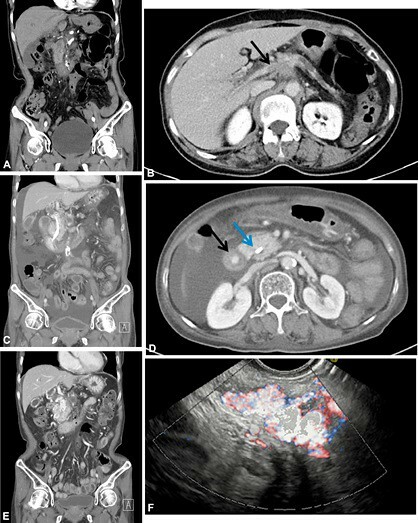 CT and endoscopic ultrasonography (EUS) demonstrated newly appeared pericholedochal varices caused by portal vein obstruction, and we judged it was the cause of previous hemobilia. Previous SEMS was removed by migration; therefore, we reinserted endoprosthesis for biliary drainage. Figure 1. A, B, CT scan showing no definite biliary varices before the plastic stent was inserted. B, Black arrow indicates cancer invasion of the main portal vein, which indicates portal vein thrombosis. C, D, Biliary CT scan showing the biliary plastic stent in the common bile duct. D, Black arrow indicates a hyperdense spot, which indicates active bleeding during the portal phase; blue arrow indicates the biliary stent. E, CT view showing features suggestive of advanced pancreatic cancer and dilation of the pericholedocal vessels. F, EUS showing expanded vascular structure around the common bile duct. We have explored the feasibility of using covered SEMS to resolve fatal hemobilia. There have been few case reports of stent treatment for massive hemobilia. Indeed, SEMS treatment of fatal hemobilia due to pancreatic cancer-induced portal biliopathy has not been reported to date. To our knowledge, this is the first reported case worldwide. We suggest that the use of covered SEMS should be contemplated to achieve immediate hemostasis in cases of spurting hemobilia. In this case, we placed covered SEMS in the CBD to control massive hemobilia. The mechanical pressure was affected directly by the SEMS in the CBD, which would be useful for stopping massive hemobilia in an emergency. This method was safe, effective, and could proceed with diagnosis and treatment at the same time. Also, placement of SEMS seems to be a promising approach for achieving constant bile drainage.